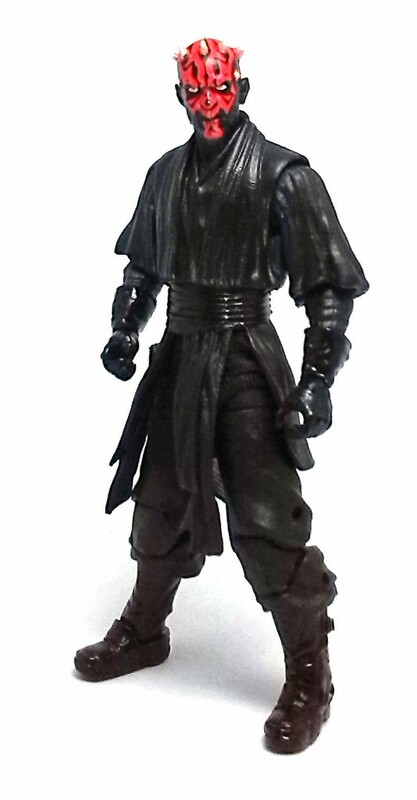 So, my first impression of the Black Series Darth Maul was quite positive despite the boring package design. Clearly visible in the window box was the figure, attired with the heavy hooded robe the character used in the planet Tattooine, an alternate head, his double bladed lightsaber and a set of electro binoculars. Once taken out of the box, Darth Maul displays a nice amount of sculpted detail, although it is not that much different than what we have already seen in the smaller 3.75 inch lines. 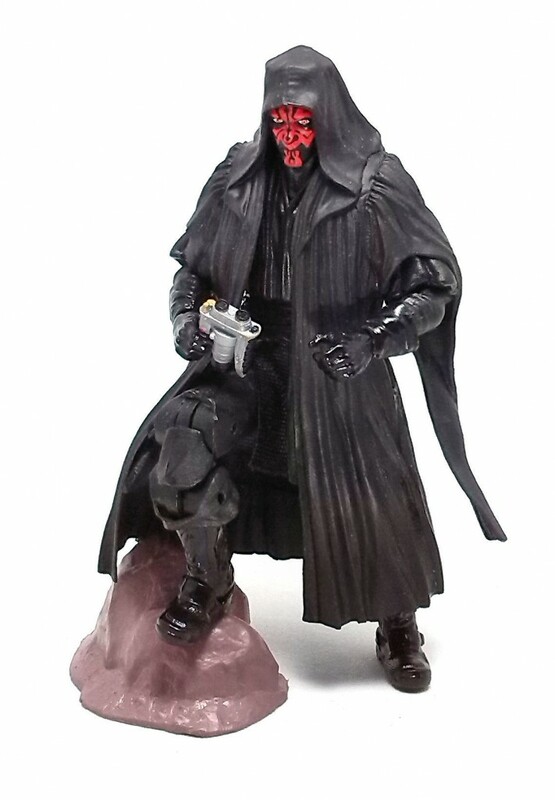 I’d like to say that the Hasbro team took advantage of the larger scale and sculpted extra folds and textures on the costume but truth is, both scales have are very similar in their depiction of the Sith assassin, up to the use of fabric to reproduce the lower half of his tunic. The part where it shows the benefits of working on a larger scale is the head sculpt, as the likeness to actor Ray Park is much easier to spot on both heads. The head attached to the heavy robe has a calmer facial expression, while the bare head has an angrier appearance. It also has sharper, thinner horns than the 3.75 versions had, although for security reasons they still had to be slightly blunted. 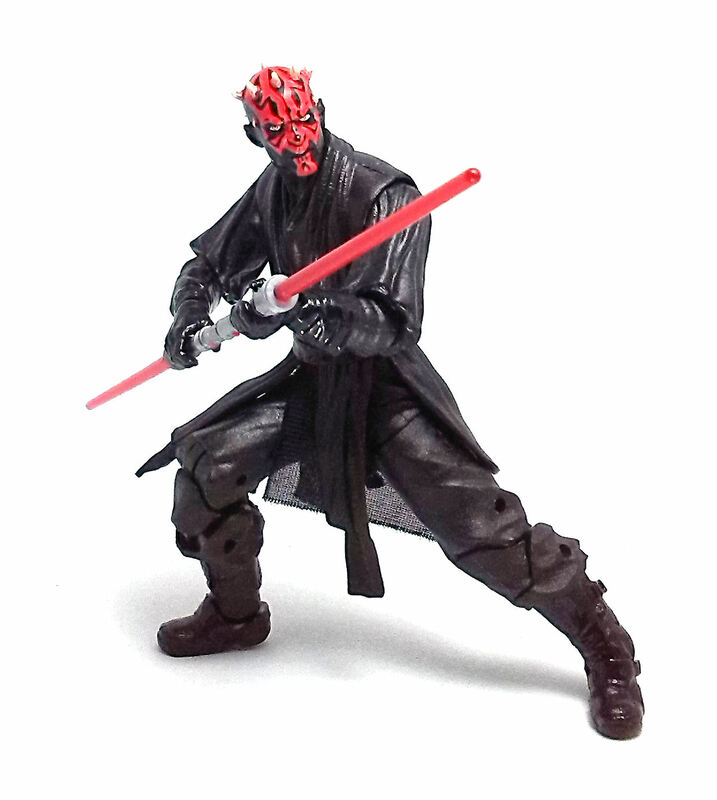 Although the costume design limits the range of movement on some of the articulation points, Darth Maul comes off as a very versatile action figure with nice balance and solid construction. Of course, the greater obstacle comes from the use of the rubber robe, but the material is pliable enough to not be much of an issue. My main point of contention with this figure, oddly enough, was the paintjob. 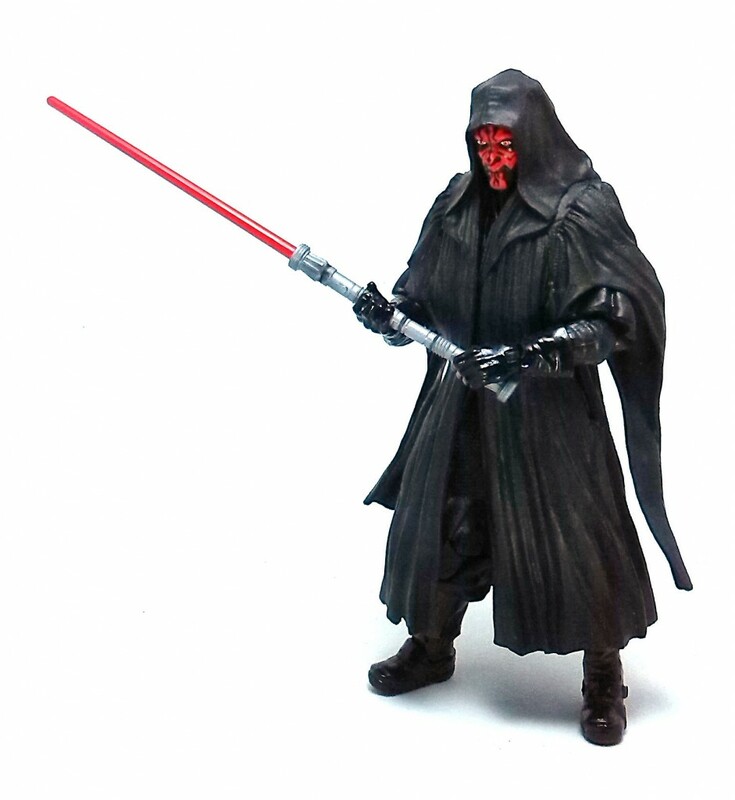 Darth Maul is a pretty monochromatic character. 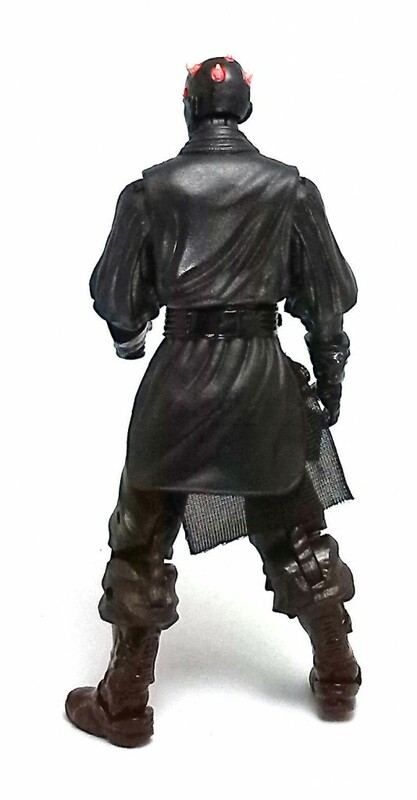 The figure was molded in black plastics with just a few gloss black applications to highlight different materials. The more complex paint operations are found on both heads. Both portraits have nicely painted Sith eyes, and decent tattoo work on the facial outline. 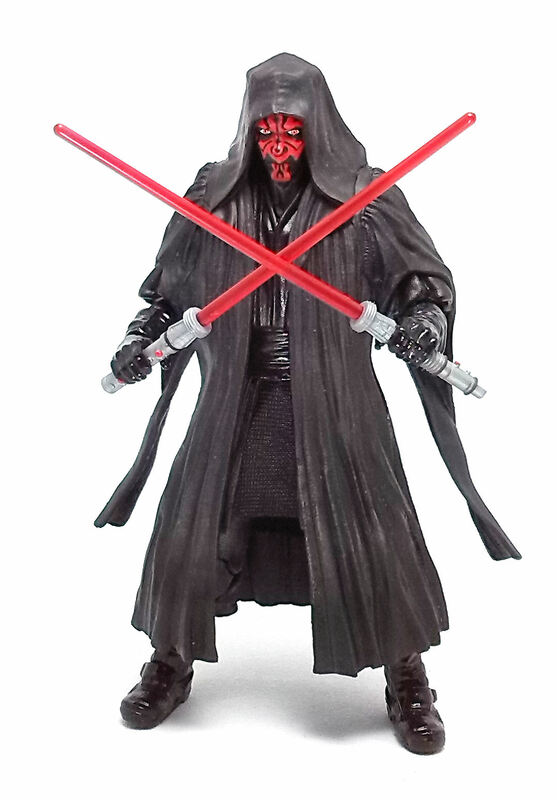 The outstanding issue I had with both of the heads was the inconsistent placement of the tattoo line that runs all the way down Maul’s nose nose. Discounting those instances where the paint was downright awful, the rest of the figures I saw in the store had the nose lines running slightly askew to either side and often enough no figure would have a consistent looking pair of heads. In the end, I ended up actually repainting those bits on my figure. 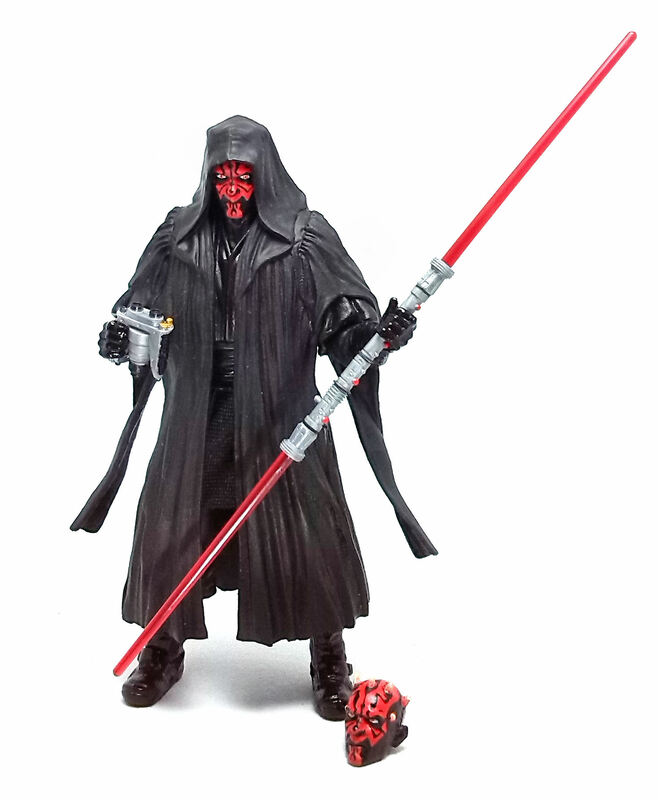 And while on the subject of deco, I must also say that Hasbro has not yet nailed the way to paint the horns on Darth Maul’s head, as the paint apps on this Black Series figure looks generally sloppy, even though the application has the right colors. 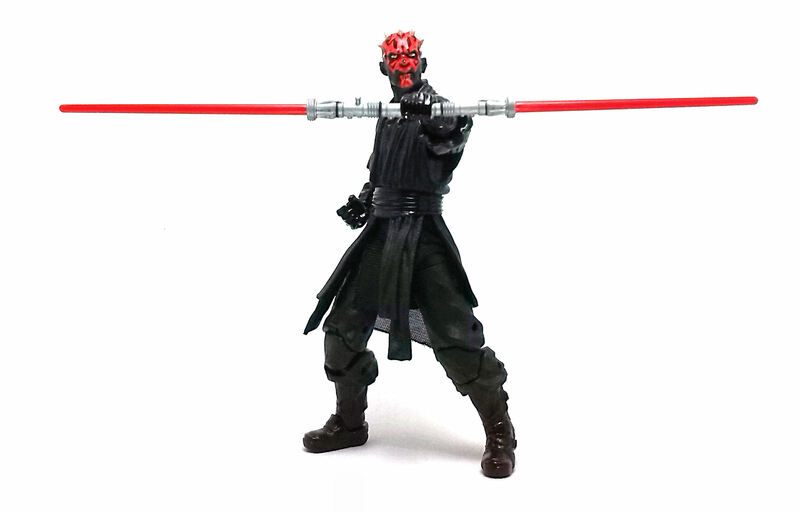 Not counting the alternate head, Maul ships with a pair of binoculars and his double-bladed lightsaber, which is actually composed of two separate hilts with removable red blades. Both halves of the lightsaber are molded from the same soft silver gray plastic used for the binoculars and connect to each other using a peg and a keyed indentation. One of these halves also has another peg to affix the weapon to Maul’s waist. Both hilts and the binoculars have painted decorations in the form of black lines and panels, as well as red applications for buttons and such. Even though the paint issues on my figure were something of a let down at first, I chose to see them as an added opportunity to indulge in a tiny amount of action figure customization, but you may want to look out for the best painted samples. With that in mind, I have to say that I found Darth Maul to be a thoroughly enjoyable addition to my collection.